As both Vishnu and Siva temples co-exist in Narsimhulapalle, the place is known as “Hari-Hara Kshethram”. The mention of this Kshethram is said to have been made in Scriptures – Brahma Purana, Brahma Vaivarthana Purana, Bhavishyothara Purana, Vishnu Purana, Siva Purana and Skanda Purana. As mentioned in the Bhavishyothara Purana, the place might have been ruled by Nanda Kings (424 BC), and consequently the place is known as Nandagiri. Sage Sootha has explained the importance of this Kshethram to Shounaka and other Rishis. According to this, in the ancient times, mountains were having wings and they were traveling freely. Once while the Malaya Mountain was traveling from Kanya Kumari to Himalayas, its four wings fell on the earth. The places where these wings fell are known as Vedagiri, Mangalagiri, Yadagiri and Nandagiri respectively. At the request and prayer of the Malaya Mountain, Lord Vishnu blessed that all these four places will become the places of worship. 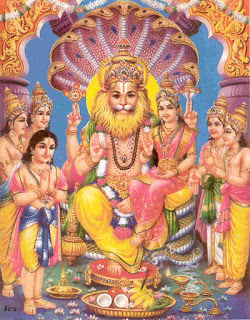 Vedagiri is called as Vyasa Peetham. Yadagiri is the place where Sage Yaadarshi performed penance. Nandagiri is the place where sage Nanda performed his penance. 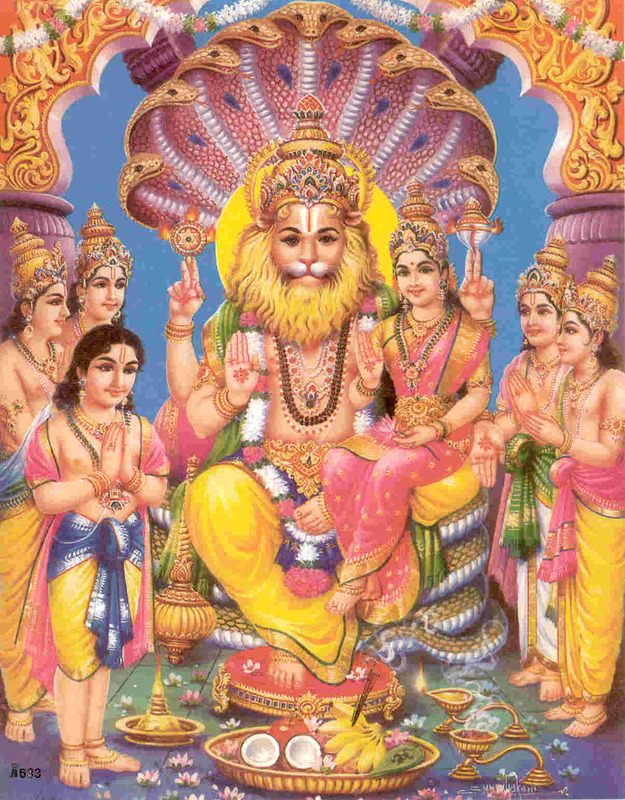 It is also said that Aadi Sankaracharya visited this place and worshipped Lord Lakshmi Narasimha Swamy and (per Vedantha Deshika) said to have installed Alwars after worshipping the Lord. There are various testimonials to state the historical and religious importance of this place. It is said that King Satakarni (241 BC), the son of King Sreemukha of Satavahana dynasty, while going on Jaithra Yathra (victory lap) from Paithan (Prathistanapuram, present Aurangabad in Maharashtra state), made a halt at Nandagiri village and very much enjoyed the natural beauty of the place and constructed a Gagana Mandiram (Sky palace) on the top of the hillock. Its ruins are visible even now. Later on, it is said that the 17th king in the Satavahana Dynasty, King Hala (who wrote Gatha Saptha Shathi in Pyshachika language) and his wife resided at Nandagiri. Even though the Satavahana kings practiced Jainism and Buddhism, they also patronized Vedic religions. They constructed temples as per the Advaitha culture on the advice of vedic scholars. It is said that the Lakshmi Narasimha Swamy temple at Narasimhulapalle village dates back to the times of Sreemukha of the Satavahana Dynasty (321 BC). Later on the rulers of Vemulawada Chalukyas (Western Chalukyas, 755-968 AD) patronized this temple and the Stepped Pyramid type of the Aalaya Gopuram reflects the temple architecture of the Western Chalukyas. The Veerabhadra, Mallikarjuna and Nanchareesvara (Somanatha) temples of Narasimhulapalle village reflect the Kakatiya temple architecture. Therefore, they can be said to belong to the 12th¬ century. As Nandagiri once existed in an ancient mud fort, it is known as Nandagiri-Kotla, and Narsimhulapalle is also called Kotla-Narsimhulapalle. Before the Mauryas came to power, the Nandas who ruled over Magadha are stated to have set up a military camp on the banks of river Godavari known as Nava Nanda Dera, which is now known as Nanded. The Nandas, who had their sway over the region, are believed to have founded this Nandagiri with a mud fort around it and the traces of its moat and walls can be noticed here and there in the twin villages of Nandagiri-Kotla and Kotla-Narsimhulapalle, which once existed within the Kota or Fort. There are ruins of the fort on the top of the hillock. Two or three stone inscriptions (Shila Shasanas) are found here. It is mentioned in the Karimnagar Mandala Charithra, a Telugu book published by Thygaraja Lalitha Kala Parishath, Karimnagar, that these stone inscriptions were investigated by Late Sri Suravaram Pratapa Reddy and poet Doopati Venkata Ramana Charyulu and published in the Telugu daily newspaper Golkonda Patrika. Unfortunately, copies of these papers are not available to ascertain the history of the place. The Department of AP State Archeology and Museums, Hyderabad, also did not make any mention about these inscriptions in the book on Inscriptions of Karimnagar District, published in the year 1974. It is necessary to bring to light the historical importance of the place as the Archeology and Endowment departments have unfortunately not taken any appropriate action in restoring and renovation of the temple or the fortress on the hillock. The Yadagiri is the most unique, beautiful and pleasant Hillock with moderate Climate in all seasons and the temple is located at a distance of about 60 KM from the Hyderabad, capital city of Andhra Pradesh. The flow of devotees / pilgrims visiting the temple for worship is very high since it is situated near the capital city. There will be heavy congregation of devotees / pilgrims during Saturdays, Sundays and other Public Holidays.